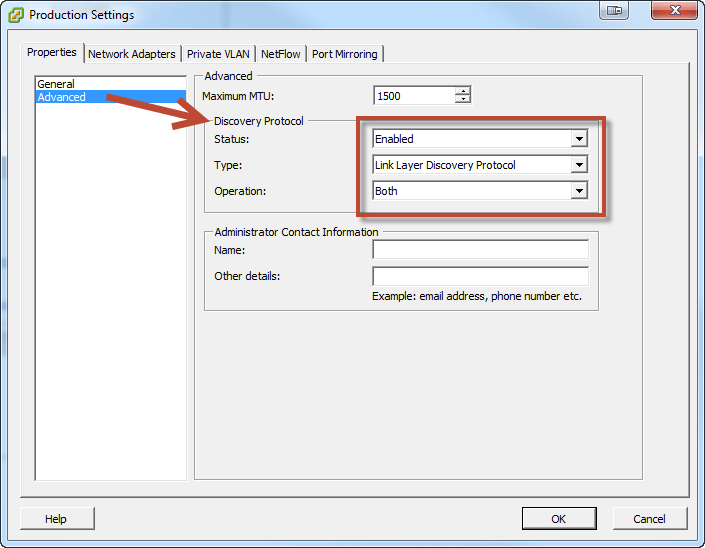 When I last covered Objective 2 of the VCAP5-DCA on the vBrownBag, one thing I didn’t get a lot of time to cover was the use of Cisco Discovery Protocol (CDP) and Link Layer Discovery Protocol (LLDP). Essentially, this is how switches help provide configuration information to people. CDP is proprietary to Cisco, and LLDP is an 802.1AB open standard. I find that enabling these protocols to both listen (learn the configuration of the upstream physical switch) and advertise (inform the upstream physical switch of the host configuration) to be quite helpful in bridging the communication gap between the server and network teams. It’s much easier when both parties can see the physical configuration and associate it with logical setups. I understand that this may not hold a lot of value in a blade environment where a small number of uplinks are providing northbound connectivity, but a rack server environment should see a lot of benefit. This post will cover enabling both protocols in your vSphere environment, as well as some views from the network side of things to help understand what information you are providing. First, let’s get the bad news out of the way. While CDP is available to both a standard and distributed switch, LLDP is only available in distributed switches. If you’re using standard switches, you’re limited to CDP. Bummer! For a standard vSwitch, you are going to have to crack open some CLI. There are lots of examples out there. I use esxcli. As with most things in life, the more expensive distributed switch has the better bells and whistles. All configuration can be done via the GUI, and is set for all hosts because the switch is distributed. You can also choose either CDP or LLDP. Just Edit Settings on the distributed switch and click on the Advanced section. I’m using LLDP in my lab as the upstream switch is an HP V1910-24G. The above is all nice and dandy, but what are you really doing behind the scenes? In other words – why do you care? No one likes tracing cables – be a pal! Here’s a screenshot of my HP switch in the lab after turning on LLDP. This is what your network administrator would see. So, if you asked your network admin to change the VLAN on vmnic1 for host name esx2, he or she would be able to quickly identify that it is connected to G1/0/5 and make the change for you. It works in a simlar fashion for CDP. Here is a screenshot of my Cisco switch with CDP enabled. Again, the network admin can quickly spot that FA0/1 is hooked into host esx and connected to vmnic3. Sometimes the small things make the largest differences. CDP and LLDP really don’t take much effort to enable, but are rarely turned on. You would probably want to confirm with your network team that they actually want this turned on before pulling the trigger, and perhaps your security team if you’re tied into a DMZ or have a “we dont allow CDP” type of policy. I’m curious to hear of any stories where this has come in handy from both a server and network admin perspective, or if you just prefer it on / off for some other reason? I always leave it on set to both. It makes the Network admins happy – they can see exactly which interface is plugged into which port – and this makes all the more difference when you are running many cables from one server between floors connected into multiple switches. It is easier to recognize and find. Curious if you know WHY LLDP is only available for vDS? Seems to me that smaller shops not using vDS would also be more likely to be running Non Cisco gear as well (something cheaper perhaps) that only supported LLDP. I can only assume that engineering hours were not focused on enabling it for the vSwitch due to priorities, or possibly a large scale client wanted LLDP for their vDS hence it was added as a feature request. I really like both CDP and LLDP and think they add great value to binding the physical and virtual network together. 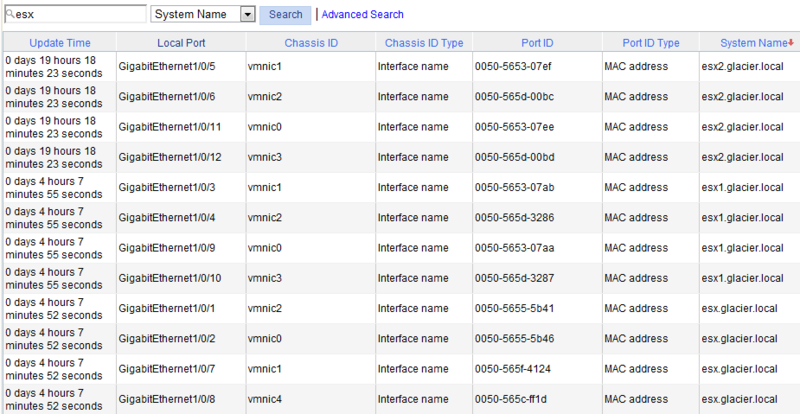 Much confusion and misconfiguration comes from the fact the it is very difficult to track which gi0/x connects to what vmnic into ESXi. Ha, glad I came across this. Setting up a test VMware box and we have a Brocade switch. Also, forgot you need vCenter to do vDS so I’m downloading that now. Need to play around with vDS before I implement it live to our environment.